It’s time to reimagine security. Conventional security detects threats too late (if at all), and resolves them too slowly. It gives security teams a fragmented, incomplete view into what’s going on in their network. It’s passive and blind to broader threat trends. And it reacts too slowly to new threats and changing conditions. 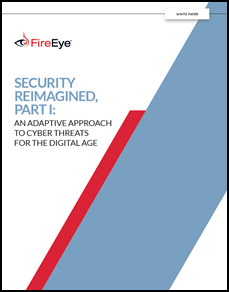 Organizations need a flexible, deeply integrated framework that offers a far-reaching view of threats and evolves as quickly as conditions do. Their security architecture must be agile. It must be deeply integrated for an end-to-end view of attacks. It must present a full picture of threats by incorporating internal and external intelligence. And it must take an active, “lean-forward” posture that doesn’t just wait for attacks but anticipates them. FireEye calls this approach Adaptive Defense™.